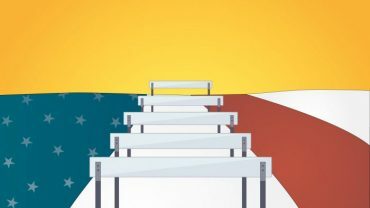 Editor’s Note: The City of Austin, Texas was recently chosen to participate in the Open Government Partnership’s pilot program for champions of open government at the state and city level. Reboot is proud to be a fan and supporter of this pioneering team. These past few weeks following the U.S. presidential election have given us pause as we reflect on the role of civil servants as stewards of public trust. We have seen how, at the macro level, the mere word “government” can evoke compulsive scorn, even as we in Austin have worked hard to build trusting relationships at the local level between civil servants and civil society. In the years ahead, local governments have an important opportunity—and responsibility—to redefine government. Our commitment to openness matters now more than ever, as we work to renew our social contract, one tangible, human connection at a time. The drive for transparency and greater citizen participation in Austin isn’t new—we’ve got lots of feathers in our open government hat. 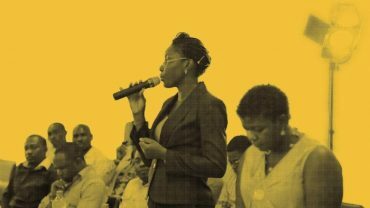 Our selection for the OGP subnational pilot program has prompted us to think about how we can build on previous successes, and how we can share those lessons with other governments. We’re taking advantage of the opportunity to make OGP commitments that redefine the relationship between people and government as a means for co-creating better outcomes, such as with Ending Homelessness in Austin. This effort departs from the traditional and misguided approach of criminalizing homelessness in cities, which further marginalizes those living on the street, disconnecting people from each other and their government, and deepening the crisis in a revolving door of jails, emergency rooms, and shelters. Instead, through continuous and adaptive systemic changes, the Ending Homelessness Coalition in Austin works to build pathways out of economic and personal crises for residents experiencing homelessness. Together, we at the City of Austin join them to help create equitable opportunities for an entire community. To ground our approach in connection, we started the effort with the most humble but vital of acts—listening. After six months of ethnographic immersion, coalition building, and experimentation with cross-sector teams, patterns began to emerge, and possible solutions became clearer. 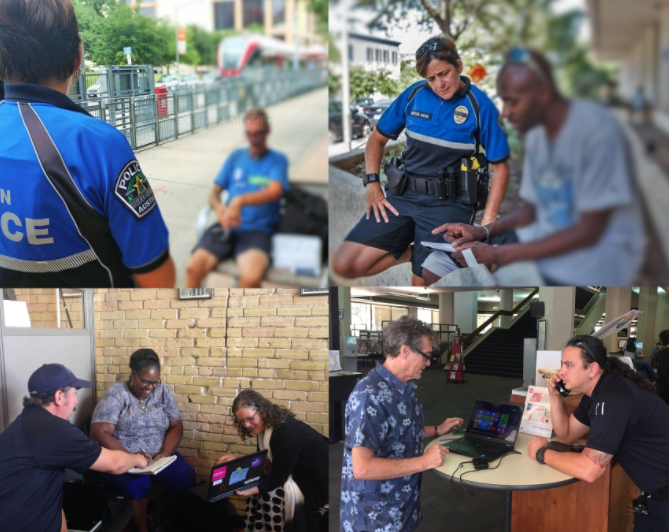 Based on the lessons learned, the City Council authorized a full year of the Homelessness Outreach Street Team (HOST) pilot to proactively meet the needs of people living on the streets. This initiative brings together the expertise of police officers, behavioral health specialists, a paramedic, and outreach social workers to bridge the gaps between social services and public safety for hard-to-reach clients. In better connecting those experiencing homelessness to services, the team also gives city officials a new understanding of what it means to sustainably work to end homelessness. Key to our success was our method: human-centered co-creation, which brings together multiple stakeholders—in this case, government agencies, service providers, and community members. 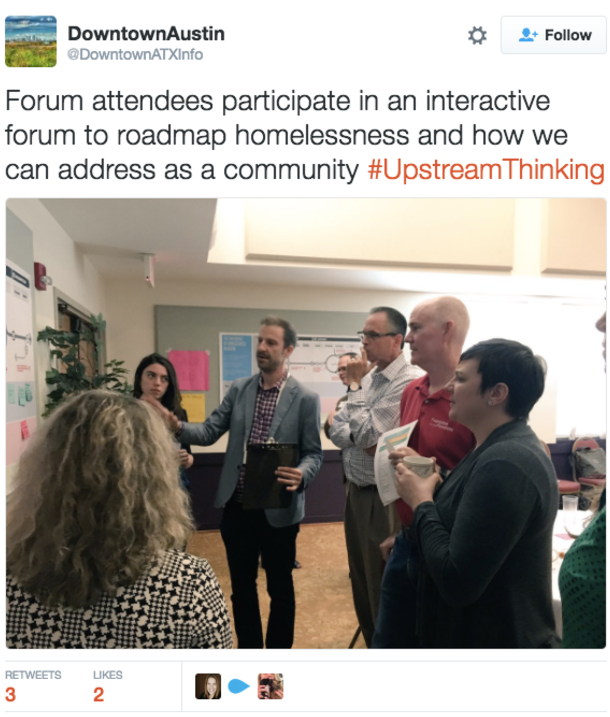 Co-creation helps to clarify the problem for everyone involved; at one recent event, for example, these groups came together to co-create a system map of the cycle of homelessness. Just as importantly, it builds shared understanding and connection. 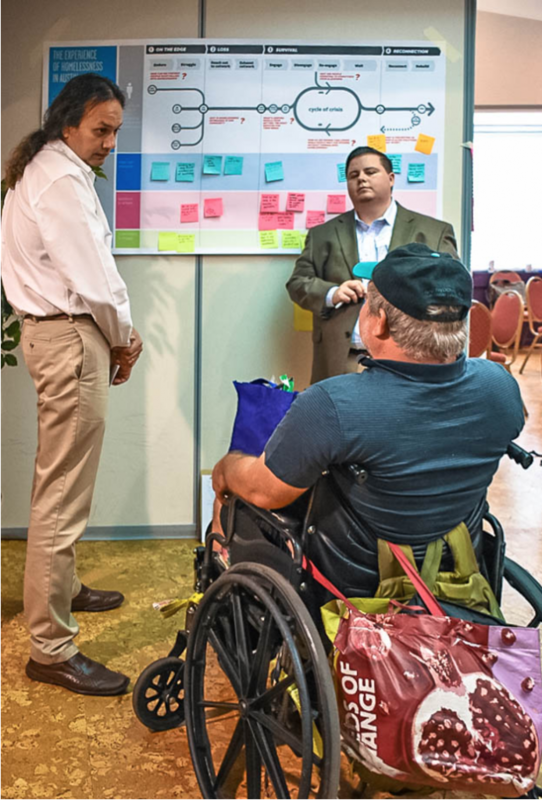 Pictured: Jeff Mulhausen from Upstream Thinking helps facilitate attendees at the community event hosted by Downtown Austin Alliance, Ending Community Homeless Coalition, and City of Austin. Photo courtesy of the Downtown Austin Alliance. For us, the experience of co-creating solutions to homelessness was bittersweet. The intimate and privileged insights people shared remind us why our work matters. The data collected by the ecosystem of service providers reminds us of the scarcity of resources, as well as the great expense to taxpayers when our systems are inefficient. Co-creation challenges us, as every day it reminds us of our limits and constraints to address the raw and real hopes, dreams, and needs of citizens. Doing this kind of work in areas that touch people’s everyday lives is messy and humbling, and at times overwhelming. But embracing the nuances and digging deeper into those challenges brings about a level of intimacy and trust that is otherwise difficult to foster between communities and civil servants. It also raises the stakes: there is no backing out once this level of connection is established. With so much work to do to serve the needs of the vulnerable while maintaining public order, and with few resources with which to do it, we feel the pressure for accountability every single day. Attendees at the community event discuss how homelessness personally affects them. Photo courtesy of the Downtown Austin Alliance. We all need connection. 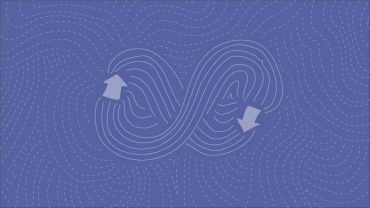 We have learned through these experiences that building shared understanding through co-creation drives human connection by meeting people where they are, clarifying experiences and facts before taking a stance, and allowing people to be honest and transparent about how their values influence their positions. It supports dignity for all. We live in an era when it’s possible to live in virtual neighborhoods online but not know the names of one’s physical neighbors. At the subnational level, we have the opportunity to create a democratic, inclusive process that can be experienced in real life. In Austin, we’re rebuilding our local public square as the place where we see each other clearly and forge connections. With that common understanding, we’ll co-create better public policy. Open government is a means, not an end. We need to collectively change the conversation to governANCE, to acknowledge that any complex social effort worth making requires persistence and maintenance, through the hard work of active listening and ongoing dialogue. We like to say that open governance is a lifestyle commitment, not a fad diet that gets abandoned after the tweets get stale. Our open government action plan includes listening and milestones that close feedback loops between government and civil society. We hope that what we learn can inform the journey of other subnational and national governments alike, and we invite you to add to this conversation, find us at the Open Government Summit in December, and follow Austin’s progress. People are ready to join in the journey to opening government, they just need to be connected.